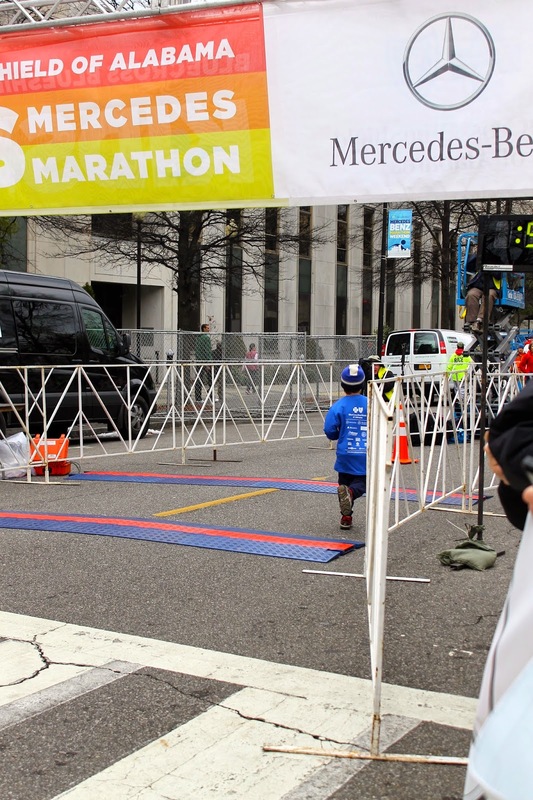 grass stains: Our Kids Mercedes Marathoner! 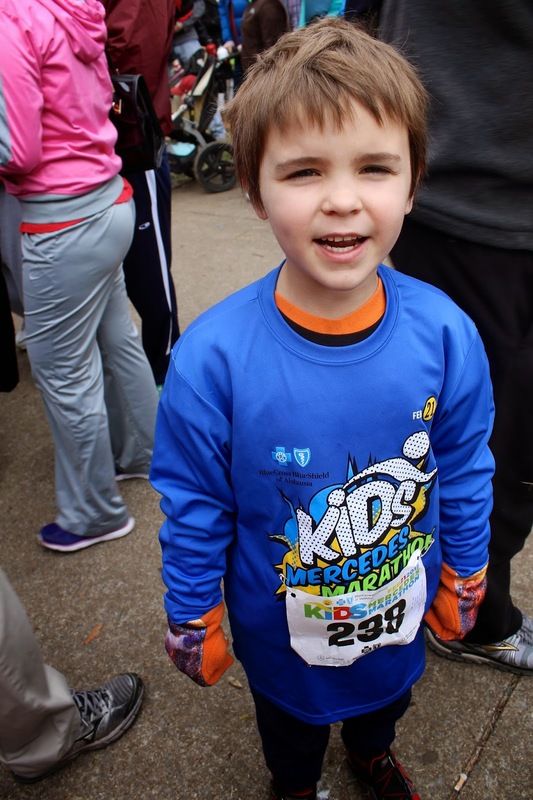 On Saturday, Jake (our ardent Participator In All Things) ran in the Kids Mercedes Marathon. 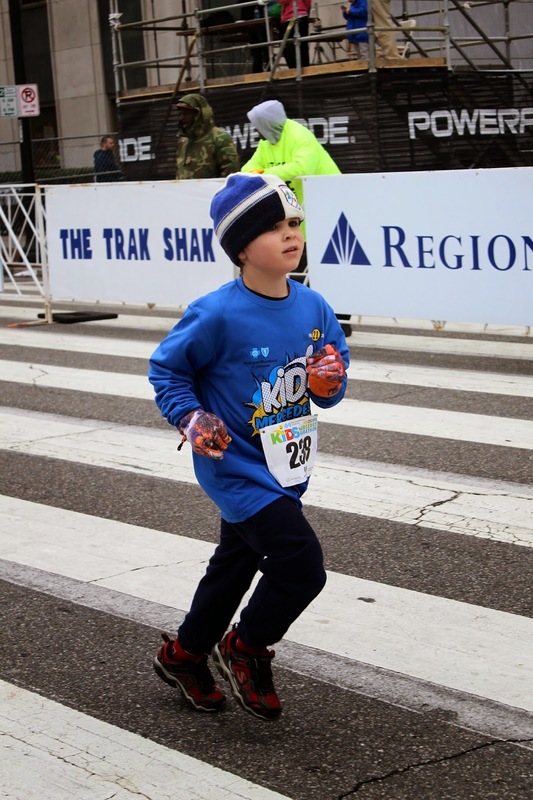 In the months leading up to the Mercedes, while adults are training to run the full 26, kids who register for the kids' version work on running a total of 25 miles. 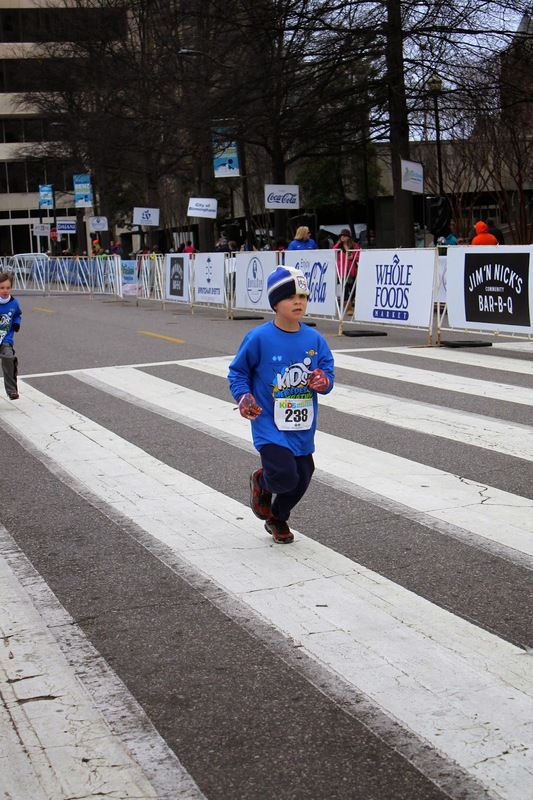 Then, on race day, they all run the last mile together. 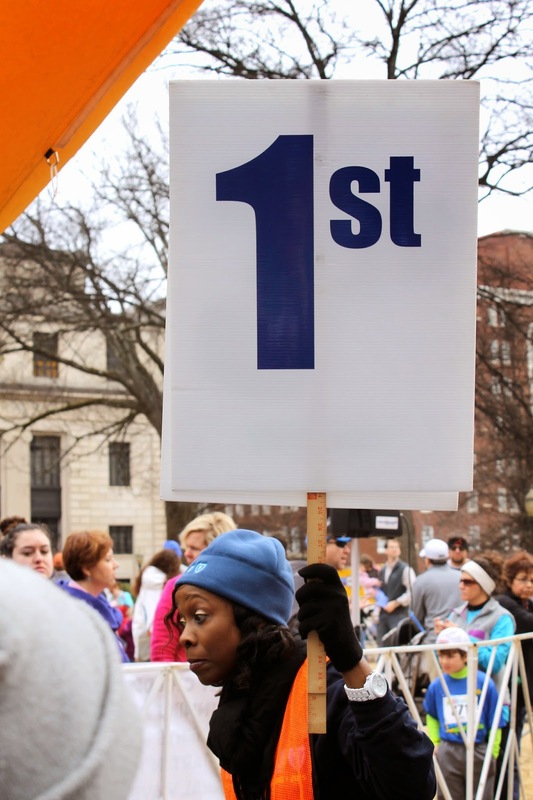 Once I got him through the chute and headed toward the Starting Line, I looped back around to try to make my way over there, myself. Even though this was only the 1st-graders -- and they were the second-to-last group to run -- it was still kind of a mob scene. Jake looked so little standing there at the back of the line of 1st-graders. Then the race monitors raised the banner and it was their time to go! 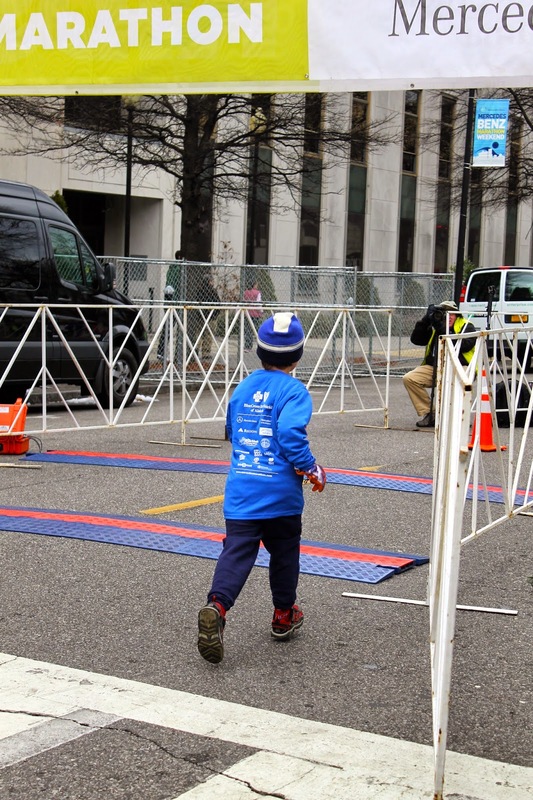 We turned around and immediately headed back across the park toward the Finish Line. 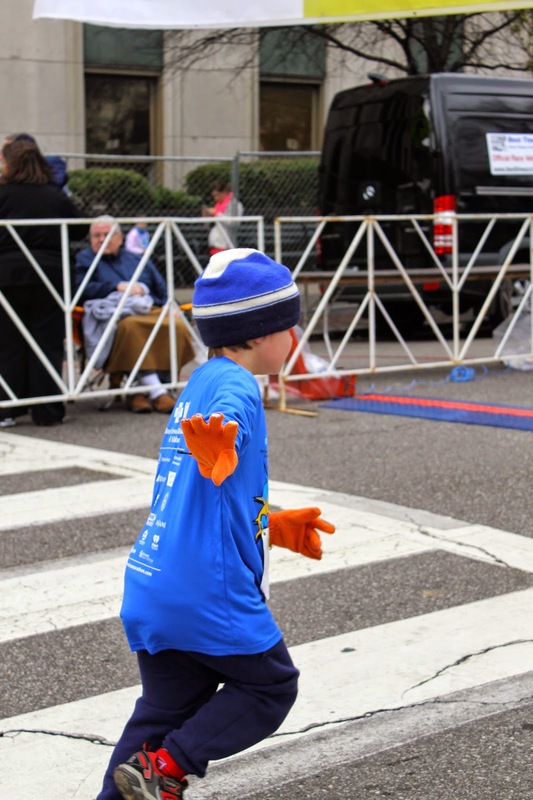 We knew that Jake had been in the last group of 1st-graders to take off, so we knew we had plenty of time ... but we weren't sure exactly how long it would take him to finish. 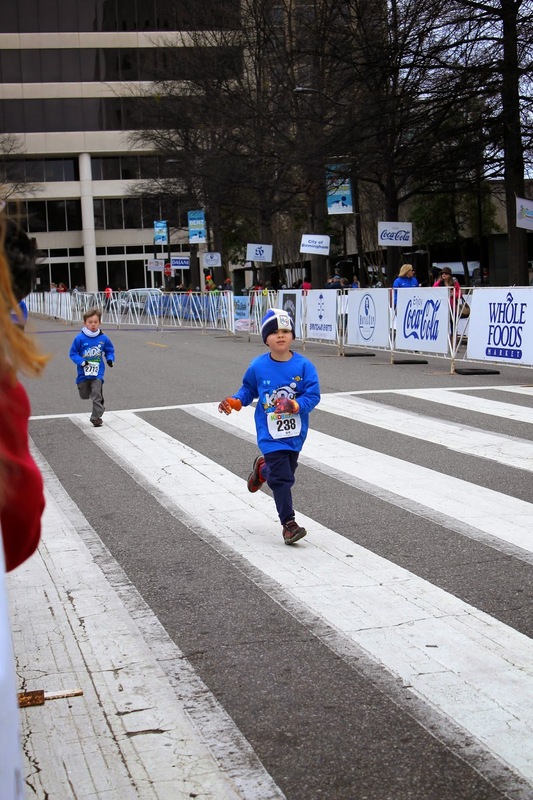 We watched what seemed like THOUSANDS of 1st-graders complete the last hundred yards of the race. They just kept coming and coming ... and coming. 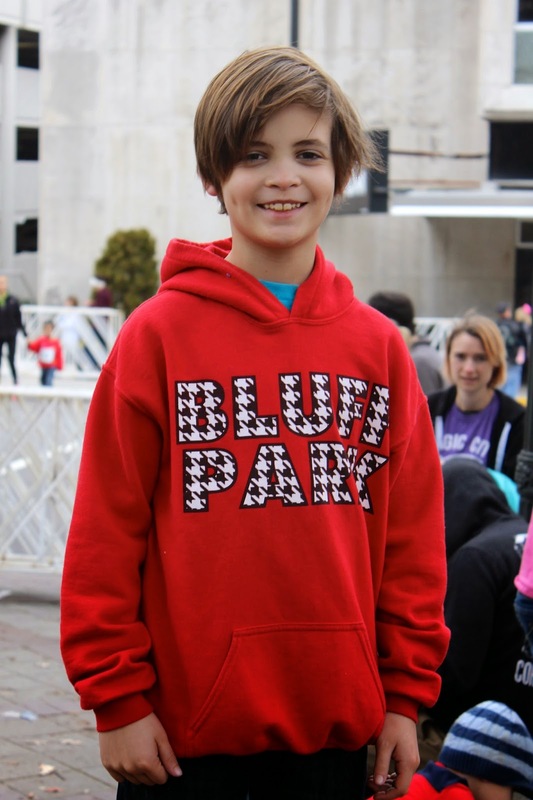 The occasional kid would slap fans' hands as he ran by. It was adorable. Amelia was less than impressed by the entire spectacle ... as it turns out, she was working up to a fever and stomach bug, but we didn't know that at the time. Nick was really kind, just doing what was asked and cheerfully trying to figure out if and how there were any way he and Jake could possibly earn points in Minecraft in exchange for Jake's participation in the race. Just when we thought we couldn't wait any longer, the race emcee announced, "And the dogged Jake H____ crosses the Finish Line!" 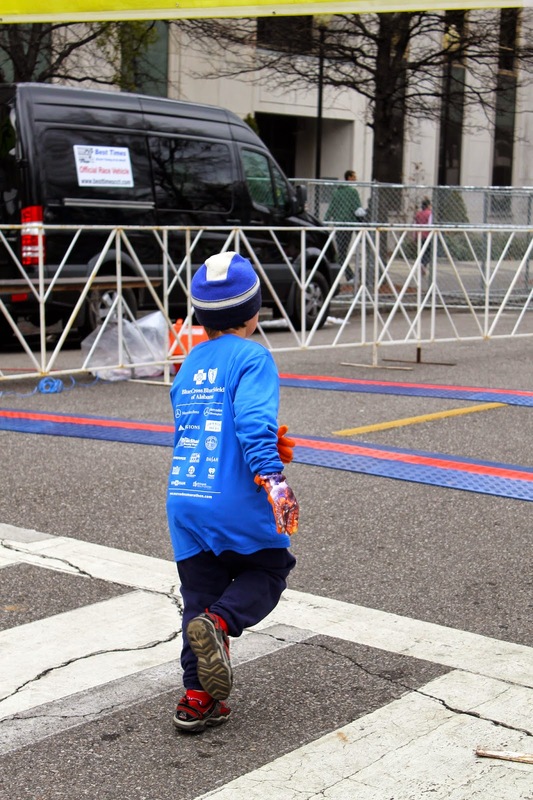 He waved at us as he chugged by, determined to cross the Finish Line and get a drink as soon as possible. Immediately afterward, we met Jake at the pickup area where they had funneled the kids out into corrals, sorted by the last digit of their race numbers. He was so excited about his new medal! Jake signs up to do virtually everything that's available to him. He cracks me up ... I don't know what made him want to run the Mercedes, other than the fact that it exists and someone told him that he could. Do you have kids? Do they participate or do they lay low?